When I was a sophomore at UCLA and struggling with, among many things, the anxiety that comes with trying to decide if a career as a musician suited me and was even possible, Professor Carlson’s music theory class was an oasis for me. His syllabus contained no rules, formulas or dates to memorize. Instead, there was page upon page of beautiful, glorious music to listen to, marvel at and put under the microscope to unearth exactly how it was constructed. Professor Carlson wasn’t an orator; he didn’t tell jokes or come up with flashy tricks to keep students interested in class (I distinctly remember his raised monotone voice saying “We have sleeping people!” as students who had partied hard the night before tried to catch up on their needed rest). I’ve been known to sleep through a 9 am class or two, but never ever Professor Carlson’s music theory class. It was too wonderful. He simply let the music do the talking, and as we discovered together the magic of Bach fugues, Schumann Lieder, and Debussy Preludes, his love of music shined through as bright as the music itself, and I had no choice but to love it as well. I’m sure I wasn’t the only student who felt this way, as the ‘I <3 Mark Carlson!’ tee shirts making their their way through the music department could attest. Now as the cellist of the Garth Newel Piano Quartet, I finally have an opportunity to perform Carlson’s own Piano Quartet (which was commissioned for Pacific Serenades, by Elizabeth H. Henderson). As we’ve gotten to know this piece over the past few weeks, I can really feel his love of music, of tonality, and of the joys, sorrows and expressiveness of life coming alive in his piece. In October of 1990, Charlie Swigart, my closest friend and life-long companion of nineteen years, died of malignant melanoma. About a year and a half later, I wrote my Piano Quartet, the first piece written entirely after his death. And though it was not consciously intended to be so, it is very autobiographical, written out of the intensity of the many emotions I have experienced in my grief. The first movement is a Tarantella, depicting the wild and manic dance that was thought in ancient traditions to be a cure for the venom of a tarantula bite. This movement depicts the process of metaphorically eradicating not poisonous venom but pain and frustration at losing a loved one. You can hear inspirations from Bernard Hermann, one of Carlson’s favorite composers, as this movement is frightening and ultra intense. The third and final movement, Capriccio, is a musical celebration of the joy that comes from healing, as well as the memory of Charlie Swigart, which will always live on. 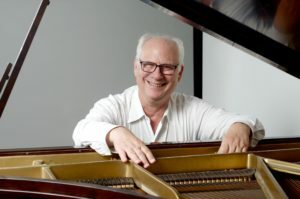 I have learned during my young career as a cellist the importance, necessity and fun of embracing all forms of new music, whether it relates strongly to the classical pillars of Bach and Beethoven, harkens more to the Jazzy or popular beat-oriented styles, or explores completely avant guarde soundscapes and possibilities. But the fact will never change that the reason I became a cellist in the first place is because of my love of tonal classical music, the lush lyrical melodies, the complex and seductive harmonies, the singing phrases. Mark Carlson’s Piano Quartet is a piece of new music that has all of these qualities, and it is so refreshing to know that there is still a place for a piano quartet like this in today’s world! You can hear us perform Mark Carlson’s Piano Quartet at various times throughout the 2017-18 season, beginning on our March 4th Pub-Series concert.